This post was written by Nancy DeMoss Wolgemuth with Mindy Kroesche. One of the challenges of complete surrender to Christ is that we don't know what lies ahead. Doubtless, some of us might be more inclined to surrender if God would hand us a contract with all the details filled in. We'd like to know what to expect. We want to see all the fine print so we can read it over, think about it, and then decide whether to sign our name on the dotted line. But that's not God's way. God says instead, "Here's a blank piece of paper. I want you to sign your name on the bottom line, hand it back to Me, and let Me fill in the details. Why? Because I am God; because I have bought you; because I am trustworthy; because you know how much I love you; because you live for My glory and not your own independent, self-promoting pleasure." Lord, I give up my own plans and purposes, all my own desires, hopes and ambitions, and I accept Thy will for my life. I give up myself, my life, my all, utterly to Thee, to be Thine forever. I hand over to Thy keeping all of my friendships; all the people whom I love are to take second place in my heart. Fill me now and seal me with Thy Spirit. Work out Thy whole will in my life at any cost, for to me to live is Christ. Amen. It was during her years at Moody that God first tested her commitment. Although Betty had always assumed she would serve as a missionary in China, the Lord began drawing her attention to Africa, especially to the suffering of lepers. Could she lay down what she had thought was her calling, the place where her parents served and she had grown up, and give her life to service elsewhere? She was also drawn to a young man named John Stam, who had plans to be a missionary in China. The tug on her heart must have been a powerful one. Through a poem she wrote and sent to her father, we can see her joy and peace at surrendering her desires and her future to the Lord. I'm standing, Lord: There is a mist that blinds my sight. The rock is hard beneath my feet; I nearly slipped, Lord, on the sleet. Thou hast beset-these rocks are Thee! God did make the call to China clear, and after completing her schooling, Betty returned there in 1931 to serve with the China Inland Mission (CIM). But the question of marriage was still up in the air. Although she and John Stam had expressed their feelings for each other, John still had one year of schooling to complete and had not yet been accepted into CIM. Betty left for China with no formal commitment between them and chose to leave her future in God's hands. The following year, John sailed for China to serve as a missionary with CIM and was able to reunite with Betty—and an engagement followed shortly. They were married in October of 1933 and served together in the Anhui province. During the day, they visited nearby villages to share the gospel; in the evenings, they helped to lead meetings with another missionary in the area. The work was difficult, as the area was mountainous and the people extremely poor, but the Stams rejoiced at the opportunity God had given them to share the good news of Christ. On September 11, 1934, their daughter, Helen Priscilla, was born. Three months later, John and Betty, along with their infant daughter, were arrested by hostile Communist soldiers. After spending the first night in a local prison, they were forced to march twelve miles with the soldiers to another town. They finally stopped for the night at the home of a wealthy man who had fled. Before they left the next morning, Betty hid her baby in the house inside a small sleeping bag. Then, John and Betty were marched down the streets of the town, their hands tightly bound, stripped of their outer garments. On their way to the site of the execution, a Christian shopkeeper tried to persuade the soldiers not to kill the couple. He, too, was dragged away to be killed. When John pled with the soldiers not to kill the man, the Communist leader ordered him to kneel, then beheaded him with a sword. Betty fell down bound at her husband's side, no scream coming from her lips. Moments later, the same sword that had killed her husband ended her life. Baby Helen was discovered thirty hours later by a local pastor. She was safe and warm, apparently none the worse for having gone all that time without milk. Inside her clothing, the pastor found extra diapers and two five-dollar bills that Betty had pinned ther—-just enough to provide for a rescue party to get her to safety. Betty was twenty-eight years old when she was killed. When she wrote the words of her well-known prayer, "Work out Thy whole will in my life at any cost," she had no way of knowing what full surrender would cost her. 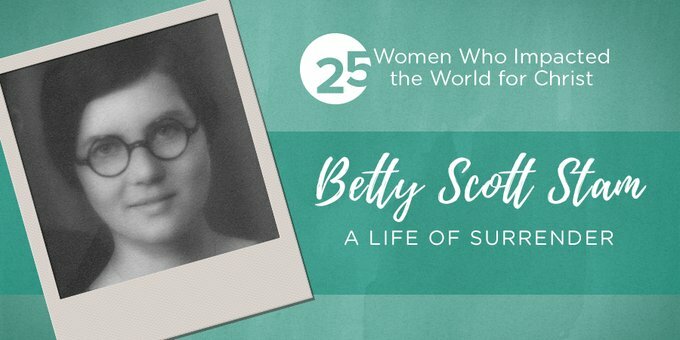 Although some might consider the cost exorbitant, I am confident that Betty, having laid down her life for Christ, would not think the price too high. She had relinquished all that she was and all that she had, into Christ's hands for His safekeeping. Elisabeth Scott Stam, February 22, 1906 "
God's plan for your life and mine will not look exactly like His plan for Betty Stam. But as followers of Christ, we, like Betty, are called to give up our own plans and embrace His will, whatever that may be. God may be asking you to be faithful to a husband who's difficult to love, or to homeschool your children, or to mentor another young woman. Would you re-read Betty Stam's prayer toward the top of this post and make it your prayer? Since His love surrounds you, you, too, can stand, and you can sing as you follow Him, wherever He may lead. Quest for Love by Elisabeth Elliot, Fleming H. Revell, © 1996 by Elisabeth Elliot Gren. 1 Elliot, Elisabeth, Quest for Love (Grand Rapids, MI: Fleming H. Revell, 1996), 116.